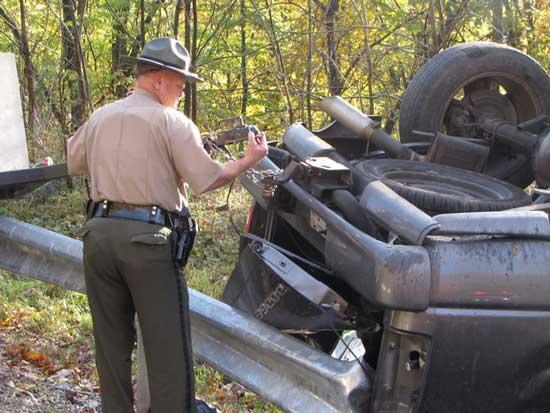 Tennessee Highway Patrol Trooper Bruce Pryor inspects the trailer hitch that had come disconnected by the impact and rollover on the guardrail. Thursday afternoon the all too frequent sounds of sirens warning traffic that something has happened or someone needs help broke the silence of Woodbury. Emergency personnel were called to a one vehicle accident with injury (10-46) that had just occurred on Highway 70 below the Stock Barn. The fire department, ambulance, rescue squads as well as deputies and the Tennessee Highway Patrol were called to the scene. The crash happened in the curve going uphill and towards Warren County. This same scene has been the site of many crashes in Cannon County, some resulting in death. This accident involved a father and son from Doyle, Tenn. in nearby White County. Robert Dale Bennett, age 41, was driving his 2004 Dodge truck pulling a trailer when the trailer evidently slipped sideways and caused the left side (drivers side) of the truck to slide uphill into the guardrail causing the truck to rollover a couple of times. His father Robert L. Bennett, age 71, was a passenger in the vehicle. Both men were wearing a seat belt according to the father. Trooper Bruce Pryor investigated the accident and he reported to the Cannon Courier that no charges would be issued and because of the rain and wet roads he classified it as an accident. Dale Bennett was transported from the scene to the Stones River Hospital by the Cannon County Ambulance Service. His injuries are not believed to be life threatening according to his father who had remained at the scene of the mishap. The Bennett’s were returning from a trip to Nashville to deliver Dale's motorcycle to the shop.